In the winter of 1878 by request of a temporary resident of Welaka the Rev. W.H. Williams of Crescent City began a monthly service in the afternoon of a Sunday. The service was held in the public school room which was two lower rooms thrown into one in a tumbledown dwelling. Occasionally the service was held under the oaks on the banks of the beautiful St. Johns. The scene thus presented was almost awe inspiring and one long to be remembered by each participant. The white robed priest with head faced to the breezes which gently played with his gray locks. Above whom the gracefully swaying oaks gently played a sweet and harmonious accompaniment to the singing, back of whom could be seen through the quivering leaves the distant silvery sheen of the waters of the St. Johns as they lazily drifted toward the sea. Arched above all could be seen through the tree tops the beautiful blue dome of God's temple with here and there a fleecy white cloud to offset the solid unchanging monotony of the blue. All of which combined to make a beautiful impressive picture. The harmonious blending of which made a lasting impression upon the minds and hearts of all who saw it. The congregations were uniformly good, composed of persons of various religious beliefs. After a few months passed the building of a church began to be agitated. The present site was given not long thereafter by Mr. Reed of Jacksonville. The erection of the church was commenced early in 1880 and it was ready for occupancy in a few months, not finished, however, for it was only boarded up with rough boards and was unfinished in the interior and there was no bell or belfrey. Soon after the opening several persons were baptized June 3, 1881. The name Emmanuel, meaning "God With Us", having been chosen, the church was consecrated by Bishop John Freeman Young. The Rev. C.S. Williams and A.B. Stuart Marten assisting at the service. A delegation from Crescent City, San Mateo, and Palatka was present. Confirmation was administered at the same time to ten persons. Seven of whom had been baptized on a previous Sunday at the celebration of Holy Communion, June 17, 1881, when eight persons knelt at the chancel rail, this being the first communion service ever held in the church. The monthly services continued until the summer of 1882 when the Rev. C_S. Williams being called by the vestry of St. Marks Church, Palatka, to take the rectorship of that church, resigned his charge of Emmanuel and the Church of the Holy Comforter, Crescent City, to the care of the Rev. A.W. Knight of Jacksonville. He continued to hold monthly services for a few months when through lack of support the services were discontinued and the church closed. It remained so for several years with the exception of an occasional service or a visitation of the bishop until the fall of 1889 when Bishop Weed appointed the Rev. E.C. Belcher to take care of Emmanuel and the church at Federal Point. The Rev. Belcher started in with a will and after several months was rewarded for his labor be seeing a renewed interest in the church spring up and March 7, 1890 on the occasion of the Bishop's visitation presented a class of twelve adults for confirmation. A movement was then inaugurated with the object of remodeling and completing the church both inside and out. After two years of hard labor the communicants of Emmanuel could point with pride to their church, complete in almost all of its appointments and with a very largely increased list of communicants. Richard Upjohn came to America from England in 1829 at the age of 27. He brought with him a dedication to Revived Gothic design. In the early 1900's this was the primary design of architecture considered suitable for Anglican churches. Emmanuel Church is known as Carpenter Gothic design. It is constructed of horizontal board siding of heart pine. The interior paneling is a herringbone pattern of two inch tongue and groove boards. The pump organ now in use at Emmanuel is the original organ. It was built in the middle 1800's in Portland, Oregan by Small Knight & Co. We have no record as to how the organ was acquired, whether it was given as a memorial or whether the congregation raised the money and purchased the organ. We are told that there is one other pump organ of similar vintage in use in this area. Two large wooden crosses were a part of the original church, one being on the roof of the body of the church above the narthex and the other being on the belfrey. When it became necessary to reroof the church the crosses were removed to facilitate the reroofing. When the repair job had been completed the crosses had disappeared, never to be found. At one time the interior ceiling of the nave of the church was painted a sky blue complete with stars. This embellishment was done by an unknown artist. The Diocese of Florida, seven parishes strong, officially formed on January 17, 1838 and was received into union with the General Convention of the Episcopal Church on September 7, 1838. Despite natural disasters, plagues, war, economic depressions, cultural changes and disagreements within the Church, the faithful and persevering bishops, priests and laity of the Diocese of Florida have forged ahead over the past 170 years and remained focused and true to God's call. The call to live and proclaim the gospel of Jesus Christ in community, Eucharist and servant hood ministry is never realized without great sacrifice or great thanksgiving for all that has been accomplished. The Right Reverend Francis Huger Rutledge was elected in October, 1851 as the first Bishop of the Diocese of Florida. Bishop Rutledge laid a strong foundation for the diocese by focusing on mission work and Christian education for all people. In just a few years, eight new parishes were formed and various parishes provided parochial education for their frontier communities. Bishop Rutledge also had a vision for higher education. In 1860, the Bishop, as a founder and trustee, was present for the laying of the cornerstone at the University of the South in Sewanee, Tennessee. Spanning a period of more than 10 years, Rutledge shepherded the church through critical historical changes including joining and ultimately withdrawing from the Confederacy. In 1867, The Right Reverend John Freeman Young became the second Bishop of the diocese during a period of significant post-war growth. Traveling from Jacksonville to Key West, Bishop Young had a clear vision of missionary advancement for the church. In 1880, he reported that 11 churches were built or in the process of being built. The growth of the diocese was aided by the formation of the Ladies' Auxiliary Missionary Society in 1876. The cause of Christian education for rural, urban and African-American communities was pressed energetically forward. Due to significant growth, the diocese was reorganized and officially incorporated by the state as the Diocese of Florida in 1881. Bishop Young died in 1885, and was succeeded the following year by The Right Reverend Edwin Gardener Weed. Bishop Weed dealt with three large crises at the beginning of his episcopate. The Yellow Fever Epidemic of 1887, the great freezes of 1894 and 1895 that destroyed most of the diocese's citrus industry and the Jacksonville fire of 1901. None of this stopped the call of the diocese from ministering to the needy and planting new missions. By 1892, there were over 110 parishes and missions throughout the state of Florida. In 1892, under Bishop Weed's direction, the General Convention voted to divide the Diocese of Florida. The Missionary Jurisdiction of Southern Florida was created and officially became the Diocese of South Florida in 1923. The seat of the diocese of Florida was moved from Saint Augustine to Jacksonville in 1895. Bishop Weed was known as the missionary bishop; over 77 missions were founded during his episcopate. The Right Reverend Frank Alexander Juhan was consecrated Bishop at St. John's, Jacksonville in 1924 following Bishop Weed's death. He became the youngest bishop in the American Church. He had a passion for young people and college ministries. In 1924, Camp Weed opened. By 1930 the camp moved to a site near Panama City and served over 130 youth. College chaplaincies were founded at Florida State University in 1931 and at the University of Florida in 1936. The hard work and servant ministry of the clergy and laity supported the diocese through the depression and World War II, amazingly keeping every church door open to serve all communities in extraordinarily difficult times. Following the war, the number of parishes and missions grew, the number of clergy increased and church membership doubled. St. John's Church in Jacksonville became St. John's Cathedral on March 4, 1951 and a diocesan house was established in Jacksonville. Bishop Juhan continued to serve until 1956. On February 1, 1956, The Right Reverend Edward Hamilton West became the fifth Bishop of Florida. Although the 60's and 70's ushered in an era of uncertainty as issues such as civil rights, the Vietnam War, integration, and the introduction of the new Book of Common Prayer created divisiveness between the diocese and individual congregations, the work of the faithful people of the diocese in Christ's name continued and grew. The number of clergy increased to more than 90 and 15 churches, 10 missions, and 13 new parish houses were created. New ministries were created to deal with the needs of the impoverished urban areas of the diocese. Three high-rise apartment buildings that would house 800 elderly people of most incomes in a retirement type of community were built in downtown Jacksonville and occupied immediately. In addition to the 9 parochial schools in North Florida, Jacksonville Episcopal High School was founded in 1966. In 1974 The Right Reverend Frank Stanley Cerveny was elected the sixth bishop of the Diocese of Florida. Bishop Cerveny's episcopate coincided with the ordination of women, revisions to the prayer book, and other issues that had the potential to create disunity but firmly leading his flock the Bishop preached, "Diversity rooted in community will be creative rather than destructive." Bishop Cerveny's emphasis was centered on evangelism and spiritual growth for the people of the diocese. A long time friendship with the Bishop of Cuba led to the development of a companion diocese relationship with Cuba that has deepened and grown over the years. Camp Weed moved to its current location on White Lake near Live Oak in 1980. The new centrally located site was more convenient for diocesan-wide events and became a spiritual haven for recreation, renewal and reflection for a growing and engaged laity. In 1976 Bishop Cerveny introduced Cursillo, a renewal movement led by lay people for lay people. Upon Bishop Cerveny's retirement (in 1993), The Right Reverend Stephen Hays Jecko was named Bishop in 1994. Bishop Jecko outlined an ambitious agenda that positioned the Diocese as both a missionary and servant body that spearheaded programs for the homeless, imprisoned, and inner city poor. Spiritual renewal programs such as Discovery and Alpha were introduced and implemented in many parishes. Bishop Jecko also developed continuing education programs that supported both priests and laity in their call to serve Jesus Christ through the church. In 2003, with the election and consecration of the Right Reverend Gene Robinson, an openly gay priest in the Episcopal church, Bishop Jecko was faced with an issue that created heated debate and intense feelings in both the Diocese of Florida and in the world-wide Anglican Communion. Bishop Jecko continued the missionary work of the diocese while also engaging in a series of discussions and meetings for clergy, vestries and parishioners as they began working through the controversy. Following Bishop Jecko's retirement, The Right Reverend Samuel Johnson Howard was elected the eighth Bishop of the Diocese of Florida in 2004. Bishop Howard's ministry of reconciliation has guided the diocese through a period of controversy resulting from the 2003 ordination of Gene Robinson and subsequent General Convention resolutions that have dealt openly with human sexuality. Amidst increasing controversy and conflict within the Anglican Communion, a few parishes in the diocese choose to break from the Episcopal Church and join a newly formed Anglican coalition in North America. Bishop Howard's message to the 161st Diocesan convention resonated with all "if it is a difficult and painful time, it is also a time of great promise. I believe it is a time in which the Lord is presenting us with a very special chance to renew our faith, to revisit the roots of our Church, and to reach out to one another in Christian love and fellowship." These words were put into action in the aftermath of Hurricane Katrina in 2005. The Diocese of Florida has been a national leader and long-term contributor to the rebuilding effort in Mississippi. The diocese has sent 53 mission teams and over 300 volunteers and has contributed nearly $1,000,000 in materials to help the victims of Katrina to rebuild their physical and spiritual lives and to rebuild St. Patrick's Church in Long Beach, Mississippi. The ministry of responding to the pastoral needs of prisoners and ex-offenders was aided by a new partnership between the Diocese of Florida and Prisoners of Christ. In 2006 the Snell-McCarty Youth Pavilion was dedicated at The Bishop Edwin G. Weed Camp and The Bishop Frank S. Cerveny Conference Center. Bishop Howard has renewed a call to service, Christian education for our youth and mission as the diocese begins the work of rebuilding congregations and "growing the church" in areas not previously served by the Episcopal Church. The call to serve all God's people in North Florida has remained steadfast and directed by the Holy Spirit over the past 170 years in the Diocese of Florida. Living and proclaiming the gospel in community and servant hood ministry will continue to be the call into the future, thanks be to God. 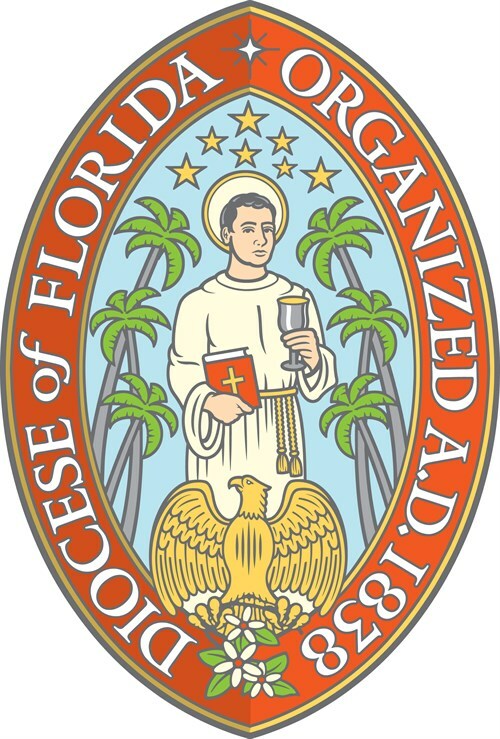 The central figure in the seal of the Diocese of Florida is St. John the Evangelist. He holds in his left hand a chalice, one of the symbols of St. John, (without the snake sometimes shown with his chalice). The Book of Common Prayer in his right hand indicates that it was in this Diocese that the first Anglican Prayer Book services to be held in the continental limits of the United States were aboard John Hawkins' ship anchored in the St. Johns River off Fort Caroline in 1565. Above St. John's head are seven golden stars representing the seven churches which organized the Diocese in 1838: Christ Church, Pensacola; Christ Church (now Trinity Church), Apalachicola; St. John's, Tallahassee; St. John's, Jacksonville (now the Cathedral); St. Joseph's (now St. James', Port St. Joe); St. Paul's, Key West; and Trinity, St. Augustine. St. John, wearing an alb, stands with three palm trees on either side, suggestive of the subtropical latitude of Florida. The eagle with wings outspread in the lower third of the seal is one of the symbols of St. John; this being a bald eagle is also a symbol of the United States. Beneath the eagle, hiding his talons, is an orange branch with the blossoms which, being the State flower, are reminders that all of the State was once included within the Diocese of Florida. The use of St. John is assumed to have an historical connection with the St. Johns River - the largest in the State, and until the advent of modern transportation, the chief means of travel and commerce within Florida.